James L. Barksdale is chairman of the board and president of Barksdale Management Corp. He also serves as chairman of Spread Networks, a company he helped establish in 2009. He served as president and chief executive officer of Netscape Communications Corp. from January 1995 until the company merged with America Online in March 1999. Upon completion of the merger with America Online, Barksdale joined Time Warner’s board of directors. 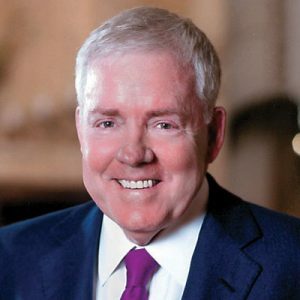 Prior to Netscape, his positions included CEO of AT&T Wireless Services and executive vice president and chief operating officer at Federal Express Corp. The Barksdale Foundation established the Barksdale Honors College at the University of Mississippi in 1997, and in January 2000, the foundation granted $100 million to the state of Mississippi for creation of the Barksdale Reading Institute to help Mississippi children improve their reading skills. In 2008, Barksdale and his wife, Donna Kennedy Barksdale, presented a gift to the University of Mississippi for the creation of the Mississippi Principal Corps, an initiative designed to change the way Mississippi school principals are trained. The Barksdales have also sponsored Parents for Public Schools’ “Schoolhouse to Statehouse” project, which trains parents to become more engaged with public schools in the state. Immediately after Hurricane Katrina, Barksdale was appointed by then-Gov. Haley Barbour to chair the Governor’s Commission on the Recovery, Rebuilding and Renewal of Mississippi. He was subsequently asked by Barbour to chair the Mississippi Broadband Connect Coalition. In January 2012, Gov. Phil Bryant appointed Barksdale interim executive director of the Mississippi Development Authority. Later that year, Bryant also appointed him co-chair of Mississippi Works, a working group of Mississippi business leaders focused on achieving greater economic success for the state. Barksdale has earned inductions into the University of Mississippi Hall of Fame; the Mississippi Business Hall of Fame; the “Legend Award” in the Mississippi Innovators’ Hall of Fame; Memphis Society of Entrepreneurs and Tougaloo College’s 2016 Light of Justice Award. He sits on the boards of several companies and foundations, including Time Warner; Federal Express; and In-Q-Tel. He was also appointed to the President’s Foreign Intelligence Advisory Board by President George W. Bush. He received his bachelor’s degree in business administration from the University of Mississippi. In 1997, he received an honorary Doctor of Laws degree from Rhodes College, and in 2001, the University of Mississippi conferred the Mississippi Humanitarian Award to him. Millsaps College awarded him an honorary Doctor of Laws degree in 2003, and in 2012, Duke University awarded him an honorary degree.